Teplice is situated at an elevation of 204 m between the Krušné hory (Ore Mountains) and the &Ccaron;eské St&rcaron;edohory (Bohemian Mid-Highland Mountains) regions. The history of Teplice is tightly associated with its famous hot springs. Archeological finds in the area suggest that the springs had already been known some 2,000 years ago. The first document describing the history of Teplice dates from 1541 and suggests that the springs were discovered in AD 762. Due to their location near important trading routes, a Benedictine monastery was founded here in 1158–1164. 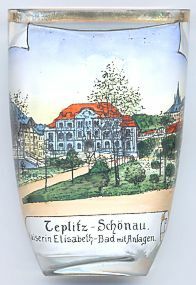 The name Teplice (German: Teplitz) is derived from the Czech word 'teply', which means 'hot'. During the 16th century the first spa buildings were set up near the springs, and the place soon gained a high popularity with the nobility from all over Europe. From the second half of the 17th century on, the princes Clary-Aldringen invested in Teplice and contributed much to the further development and beautification of the spa. Probably the most famous visitor of Teplice in the 18th century was Czar Peter the Great, who visited the hot springs in 1712. During the Seven Years' War (1756–1763) Teplice enjoyed the quite unique status of a demilitarized city where soldiers of all armies could treat their injuries. The spa also could retain this reputation as a hospital resort in later wartime conflicts as well. Most of the early architecture of the town was destroyed in a large fire in 1793. In 1812, Teplice was the location of the first meeting between the composer Ludwig van Beethoven and the writer Johann Wolfgang von Goethe, which, however, seemed to have been unfortunate because after that the two refused to talk to each other again. The pleasant surroundigs are said to have inspired Richard Wagner to write his opera "Tannhäuser". In 1813, Teplice was the site of a meeting of Czar Alexander I of Russia, Emperor Franz I of Austria and King Friedrich Wilhelm III of Prussia. The Treaty of Teplitz, signed on the 9th of September of that year united Russia, Austria, Prussia, Sweden and Great Britain in the 6th coalition against Napoleon. 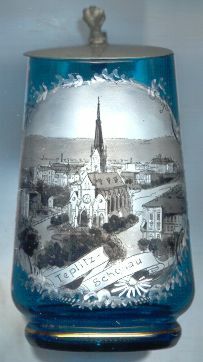 In the late 19th century, Teplitz/Teplice became famous as the "Parlour of Europe" or "Little Paris". 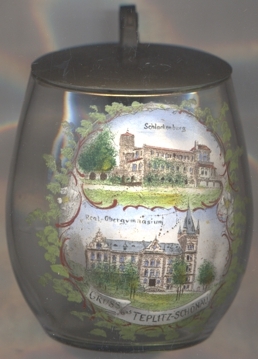 Teplice was merged with Šanov in 1895 and became known as Teplice-Šanov (Teplitz-Schönau). 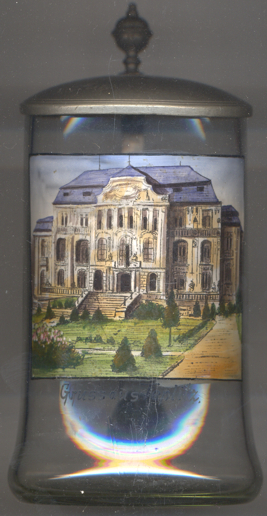 After World War I, Teplice-Šanov became part of Czechoslovakia and soon regained its popularity as a spa. 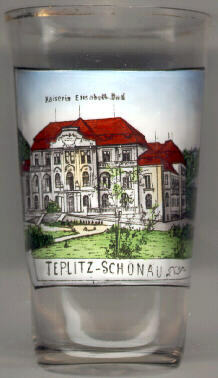 After World War II the name of the municipality was shortened to Teplice. The spa suffered severely during the decades of the Czechoslovak Communist era. Since the "Velvet Revolution" of 1989 most of the facilities of the spa have been privatized, which has resulted in a rebirth and renewal of Teplice's architectural beauty. The Neo-Gothic church of St. Elisabeth (kostel sv. Al&zcaron;b&ecaron;ty) [left] was begun in 1862. The nave was finished in 1877. The tower was completed in 1887. The building of the Stone Spa (Kamenné lázn&ecaron;) [left, no. 2346; right, no. 263] was built in Neo-Baroque and Art Nouveau style in 1911. 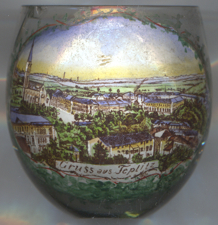 It was originally named Kaiserin-Elisabeth-Bad for the wife of Emperor Franz Joseph I of Austria, Empress Elisabeth. The later name is derived from a stone parapet that was built to prevent the mixing of the hot waters from the spring with the cold waters of the nearby creek. The bottom picture on glass no. 3212 [left] shows a view of the Real-Obergymnasium (secondary school with focus on modern languages, math and sciences). A famous son of Teplice is the Austrian arctic explorer Julius Ritter (Baron) von Payer. Payer was born in 1841 in Šanov (Schönau), today part of Teplice. Together with Karl Weyprecht he headed the Austro-Hungarian North Polar expedition of 1872. They became trapped in the Arctic ice and had to spend two winters in the ice. They also (re)discovered a group of islands in the Arctic Sea and named it "Franz Josef Land" in honour of their emperor. Julius von Payer died in 1915 in Veldes (now Bled, Slovenia).